Need a CADILLAC CT6 smart key fob? 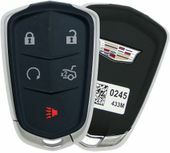 We offer CT6 keyless remotes for your Cadillac at up to 75% off dealer prices. Smart Key fobs can lock and unlock your door locks when you are simply in close proximity to your vehicle. More advanced units allow engine start as well. Nowadays Cadillac CT6 car key fobs provide safety and convenience, it's hard to live without it. Replacement transponder car keys are not cheap, but you can save big with huge discounts on our site. We sell the same OEM original smart key for your Caddy, but we do that for less.